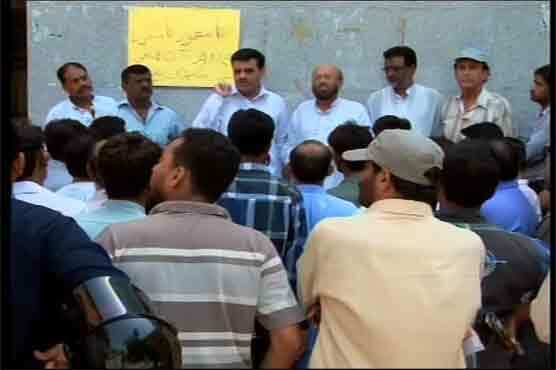 KARACHI: The paramedical staff continued the boycott of their duties and staged a sit-in outside Karachi Press Club (KPC) on the second consecutive day here on Friday, causing hardships to patients as OPDs and operation theatres facilities remained suspended in the province. Scores of patients from Karachi and interior Sindh were denied OPD services, elective surgeries and other medical facilities as paramedics continued the boycott of duties in Karachi and other cities of Sindh province for acceptance of their demand of health professional allowance. The protest of paramedical staff has badly affected patient care at government hospitals of Karachi and other parts of the province. The visiting and admitted patients are said to be suffering as the outpatients’ departments and wards almost remained non-functional due to the protest of employees. More than 200 scheduled surgeries were postponed at Dr Ruth Pfau Civil Hospital Karachi (CHK), Sindh Government Lyari General Hospital, Sindh Government New Karachi Hospital, Sindh Government Hospital Liaquatabad, Sindh Government Hospital Saudabad and other health facilities. Paramedics of Sindh, under the banner of Paramedical Staff Joint Action Committee Sindh, continued the sit-in out the KPC for acceptance of their demand for health professional allowance. The central leader of Paramedical Staff Joint Action Committee, Sindh Akhlaq Ahmed Khan, vowed to continue the boycott of duties until issuance of notification of health professional allowance from Sindh Health Department. Similarly, the boycott of employees has badly affected the patients care in government run hospitals of Hyderabad, Mirpurkhas, Sukkar, Larkana, Badin, Thatha, Nawabshah and others cities. They should be rounded up and better not give these bas-tar-ds any coverage.